Another fine new field guide useful to Adirondack naturalists is Dragonflies and Damselflies of the East by Dennis Paulson (Princeton University Press, 2011). This book contains such a wealth of detail and natural history that it may initially overwhelm the user. Still, it’s hard to argue with the author’s efforts to show and tell all we need to know. Dragonflies make themselves known in every corner of the Adirondacks in every season but winter. Paddlers may duck as big ones fly by, or they may pause to admire the dazzling colors of a northern bluet, a tiny and delicate damselfly, that lands on their bow. Fishermen and kids appreciate these survivors of the dinosaur era, too. In the lingo of scientists, dragons and damsels are known as Odonates. Enthusiasts— and there are rapidly growing numbers of them—simply call them “odes.” Another new ode guide by Ed Lam is in the pipeline at Houghton Mifflin Harcourt. Until it appears, Paulson’s book will set the standard. Hairy beasts your thing? Two excellent new field guides are available to help sort them out. 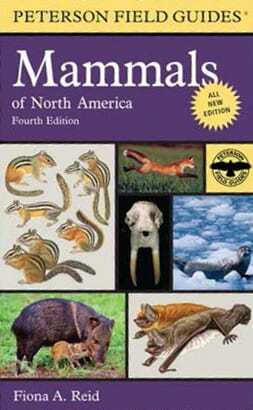 Princeton’s Mammals of North America: Second Edition, is concise, beautiful, and aimed chiefly at making identifications. One of its co-authors is Roland Kays, until recently the curator of mammals at the New York State Museum. The other volume is Houghton Mifflin Harcourt’s A Field Guide to Mammals of North America by Fiona Reid. The Princeton guide is the better choice for those aiming to make quick, accurate identifications, but Fiona Reed spreads the more sumptuous table. Her guide, in the Peterson series, packs a hefty weight and includes just about everything the student of mammals could desire: paintings, photos, skulls, life histories, identification, and more. These are both first-rate productions.